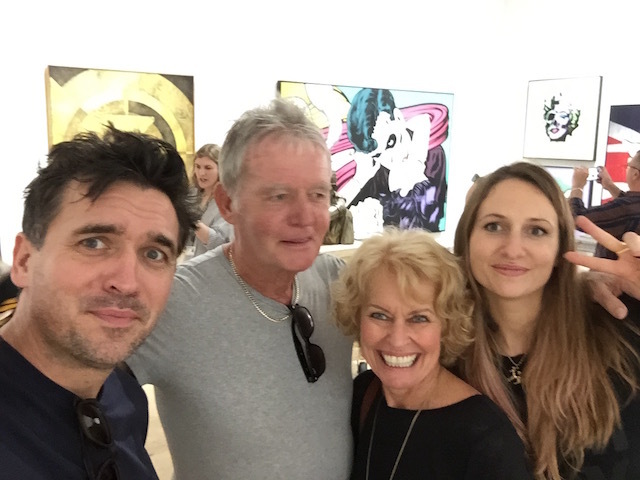 So we decided that a visit to the famous Art Basel in Miami was on the cards for the Colmans especially as Bob’s son Cassius and his gorgeous partner Jessie were there researching new artists for their London Gallery – Nelly Duff. The show is enormous with numerous venues in South Beach as well as spreading over into the design district in Wynwood. Start of the day at SCOPE South Beach – with Cassius, Jessie and Bob. We went to SCOPE on the beach as well as a lightening tour of the main show in the huge Convention Centre. Scope has many of the more contemporary up and coming artists where as Art Basel itself is more about the galleries – most of them at the highest end – with very expensive works by Picasso, Kandinsky, Anish Kapoor and other top collectible artists. Bob deciding between the Kandinsky on the wall or the Lynn Chadwick sculpture …..
Bob’s nephew Dean Zeus Colman – who I have written about a couple of times in my blogs – was there doing a rooftop painting at the swanky and very trendy 1 Hotel on Collins Ave. The rain of course made it a very difficult process but you can follow his progress on his Facebook page. The weather was desperate – pouring rain nearly every day – and the traffic was beyond terrible. We hired a car as we always do but heading to South Beach from North Miami where we stayed was a time wasting ordeal and so, dear readers, I discovered the delights of Uber ! Me with my very first Uber taxi driver – Alexander – just look at the size of those hands !!! I found out that I couldn’t register to Uber with a Bahamian cell phone so I got myself set up with a US sim card and away we went !! Many of you will be totally familiar with Uber – but for those of you who are not here is the skinny on it. It is a cheaper alternative to the normal taxi . You register on line and put in your payment details – no cash ever changes hands – it is always charged to your credit card. And you get a quote for the ride before you book it. I love that you get a pictorial on your phone of the number of Uber cars around your location – they look like ants crawling around ! !There are many more details about Uber that I won’t go into here but enough to say I will be using it whenever I can. We took Cassius and Jessie to dinner at our favorite restaurant in Fort Lauderdale one night and it was definitely worth the drive. Valentino’s – you did it again – a really great meal for everybody – even though I had to stop off at CVS to buy some Tums as I had slightly over-eaten ….. No surprises there then. Happiness is Home Depot and a new drill set for Bob ! One of my other main tasks was to buy Christmas presents for the Exceptional Learners – we do a small bag of assorted gifts for each of the 12 students – and I love putting them together.Everything had to be pretty small in size as we were carrying it all back with us – pizza party on Thursday 10th with goody bags to go ….. Pictures of that to follow……. Aventura Mall with a very sociable reindeer…. I would love to get to Art Basel one of these years… Great blog, Kathy, thanks! Every Torontonian is familiar with Uber these days as regular taxi drivers are protesting and causing traffic havoc! Yes it is a great series of exhibitions…. I know that Uber is upsetting a lot of people worldwide – and most cities don’t need any more traffic problems….. Sorry to have missed you when you were here – next time ! Nothing says ART like a good visit to HOME DEPOT!